EMLab´s field deployable mobile laboratory units provide molecular and serology diagnostics for infectious diseases caused by pathogens up to risk group 4 and pathogens of differential diagnostic consideration. The laboratory units can also provide clinical chemistry, blood count and blood gas analysis for the support of patient management. Conventional light and immunofluorescence microscopy are available as well. For some infections, commercially available rapid tests are available and these may also be used by the mobile laboratory units if their performance is suitable. The choice of diagnostic assays deployed to the field depends on the reference centre diagnosed outbreak pathogen, differential diagnostic considerations, and the availability of diagnostic assays. The units carry with them biosafety containment equipment (negative pressure HEPA filtered gloveboxes), personal protective equipment (PPE), and disinfectants so that a safe working environment can be established even in situations of limited resources. The laboratory equipment is packed into waterproof and rugged transport boxes, each weighing less than 32kg, so that they can be easily handled by personnel and carried on public transport. 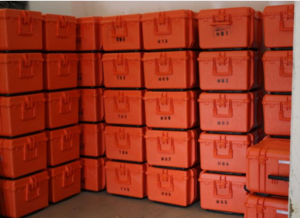 The equipment is packed in a modular fashion, so that only the boxes required for the specific assays applied need to be taken to the field. Once EMLab receives a request to deploy teams are set up for deployment and the mission is coordinated by an EMLab coordination team in Hamburg at the BNITM. The initial team for deployment of one laboratory unit are 4 to 6 persons and teams are exchanged every 3 to 6 weeks depending on circumstances. A review of the diagnostic assays to be applied is made and the modules of the laboratory are selected for deployment. The team will either take the laboratory unit with them as personal luggage or the laboratory unit is dispatched by courier to the host country along with the shipment of reagents and disinfectants, of which some are dangerous goods. In country the teams will liaise with partners like the WHO Country Office, Médecins Sans Frontières, the local health care providers (e.g. hospital) and national institutes so that travel to the site of operation, on site support (food, drink, water, sanitation and electricity) and safety and security can be arranged for as well as on site cooperation and communication be established. The EMLab laboratory units may be set up in any accommodation deemed suitable by the deployed team on site and this may be a solid building or tent. Uninterrupted electric power supply should be available for running molecular diagnostic assays. The laboratory will be set up according to the required workflow for molecular or serology diagnostics and some workstations will have to be strictly isolated from each other to prevent cross contamination. The labs feature a sample reception area, an inactivation workplace with biosafety glovebox, workstations for nucleic acid extraction, reagent mix preparation and an amplification workplace, where the PCR analyzers are run. Waste disposal will be arranged for.